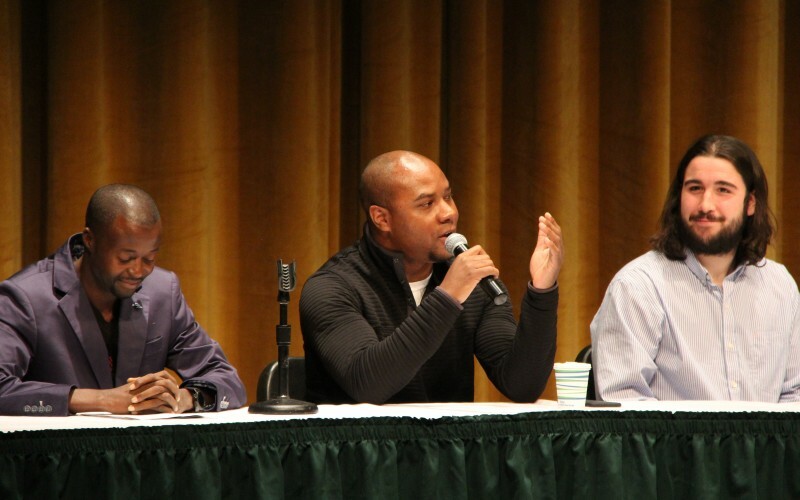 Castleton University welcomed Liberian runner Bill Rogers, alumni Michael Jabour, and student Brandon Myron as participants of a panel discussing sport as an agent of change. The discussion was moderated by Assistant Director of Admissions Raphael Okutoro and Sport Management Program Coordinator and Professor Marybeth Lennox-Levins. Rogers, who holds the Liberian national record for the 1500-meter dash, oversees The Bill Rogers Youth Foundation, which provides young children in Africa with life-changing sports activities and facilities that offer them the opportunity to develop their athletic capabilities to make a positive impact in the world. Jabour graduated with a degree in Sports Administration from Castleton and was a member of the University’s inaugural football team. He currently works as athletic director at his alma mater, South Burlington High School. Jabour, who grew up playing a variety of team and individual sports, shared his experiences as an athlete and administrator, noting the lack of diversity in athletic administration across the state. There are only two black athletic directors in Vermont, including Jabour. “Growing up in South Burlington, there were not a lot of black students. I also had a learning disability, so most people would think, ‘This kid’s dumb, but he’s an amazing athlete.’ I was also shy. Football, especially, helped me find my voice; it helped with my learning disability; and helped me to not be that shy kid,” he said. Jabour also talked about the activities South Burlington student-athletes had coordinated to raise awareness for different social issues, including a student who openly shared her personal struggles with mental health and the men’s hockey team raising the Black Lives Matter flag for Black History Month. Brandon Myron, a Sports Management major and member of the men’s lacrosse team, shared what Castleton’s Student-Athlete Advisory Committee is doing to change the culture of athletics, as well as make a difference in the community. Castleton student-athletes have volunteered locally with Fair Haven Concerned and raised funds for organizations including For Every Girl, UCan Play, and It’s On Us. Castleton sports teams have also hosted games to raise awareness, such as the women’s lacrosse team’s annual One Love game, which supports a foundation created in 2010 following the death of Yeardley Love, a women’s lacrosse player at UVA who was the victim of relationship violence. “We believe we should be helping the community and not just ourselves,” Myron said.